Each letter or number in bar shows current mode of each parameter. Each line in help relates to letter a letter or digit in yellow tab. First char in brackets equals to the corresponding letter in yellow bar and shows current mode. A short current mode explanation comes after, then is the key to press to change this mode. For example: (D) default moves , D is displayed in the bar, default moves is current move mode,  means you should press 0 on numeric keypad to change this option. Controls how character will be moved if you press keys up, down, left or right. D - default mode, work like default client. I - invert moves. If you move character, it move backward. c - normal moves and crazy moves. C - mostly crazy moves and some normal moves. d - mostly normal moves and some crazy moves. Allows character to move up to the given distance from the target. Used in automatic attack modes, in action move to target and in Follow mode. 0, 1, 3, 5, 7: distance (in tiles unit). a means attack range. (2 tiles for hand weapons and 5 tiles for bows). A means attack range for archers. It’s almost the same as a mode, except you won’t attack mobs which are close to you. D default follow mode, like in mana client. R relative follow. Character do only relative moves. M mirror follow. Character move in opposite direction. P pet follow. Character follows at distance which is set in Move to target distance. Allows your charater to switch weapon on attack, depending on distance to target. D default mode, no switching. s if target is within hand weapon range, character equips best knife. If target is more distant, character equips bow. S if target is within hand weapon range, character wear best knife and best shield. If target is more distant, character equips bow. Allows automatic move to the target and attack, auto-pick up of dropped items. D default mode. no auto moves or pickups. G go and attack mode. If target is out of range, character moves first to target and then attack it. A pickup, go and attack mode. If target is out of range, character moves to target (at the distance set with 3rd option) and attacks it. If an item is on the ground within Pickup range (set with option 10), character moves to item and picks it up. 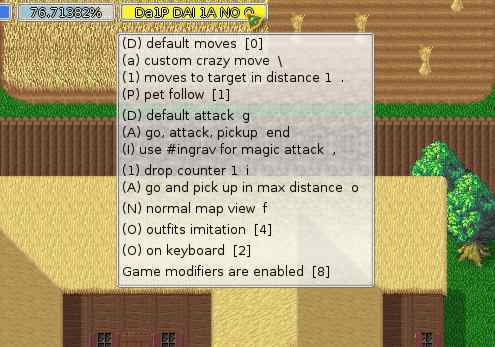 d works as D mode except auto target bug. Sets magic attack to a given spell. Magic attack can used by use of magic attack key, default is b). Sets your characters’ behaviour about PvP. Options: Possible values are 1 to 9. Controls range whithin your character picks items up automatically while pressing X or Z key. u ultra map view. Big object removed. Allow see items under most trees. U ultra map view 2. Same as u and also remove upper map layers. This allow see all players or items on map. Controls how your character behaves in imitation mode. D imitate orientation, sit, emotes. O imitate orientation, sit, emotes, outfits. F Free camera mode. In this mode moving keys moving camera and not player. Toggles enabling of all keys which are used in options bar, except this one and  (away mode); thus locks or unlocks the options configuration. When options are unlocked, Options bar is yellow. When options are locked, Options bar is gray.